Climbergirl completing the Way Too Cool! 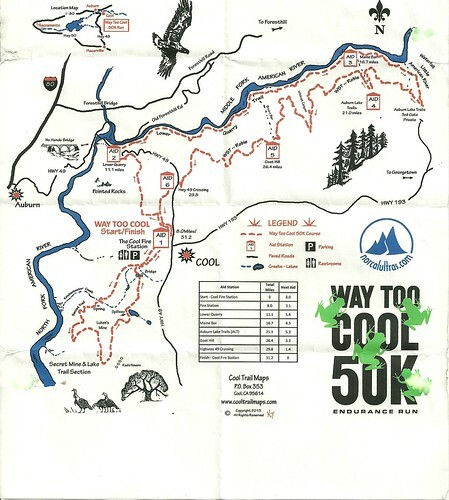 With 4 months of intensive training, I was ready to run the Way Too Cool 50K! I had heard the hardest part to running an ultramarathon is showing up to the starting line healthy. So, my training program and coach were focused and determined to accomplish this very task! Unfortunately, no amount of training can prevent a person from contracting a viral upper respiratory infection! 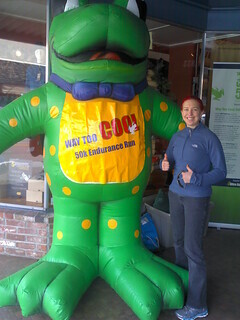 About 4 days prior to my race I was having a rough time. Seeking respite from the constant coughing and hoping for a good nights sleep, I went to urgent care. I was informed, by a doctor named Claire!, I didn’t have bronchitis or pneumonia. Yay, I was “cleared” to run the race, but would I be able to do it? You are currently browsing the climbergirl blog blog archives for March, 2013.